Own trousers worn with this outfit. Sword sold separately. Goatee and moustache not included. Be the terror of the seven seas! The most dashing pirate plunders the ships and makes off with the treasure, and this Pirate Captain has the look to strike terror into the hearts of the merchants as he flings his dreadlocks around. 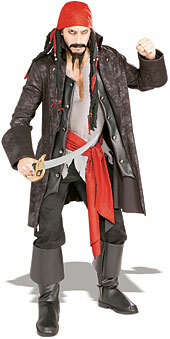 Looking suspiciously like he styled himself on the Pirates of the Caribbean's Jack Sparrow of the Black Pearl, Captain Cut throat has the jacket and the boots, the attitude and the swashbuckling style to start the pirate adventure and sword-fight his way into history. You'll feel invincible when you don the Captain Cutthroat costume too!